In March 2010 Zombie Boy created a facebook page that reached 1,516,145. 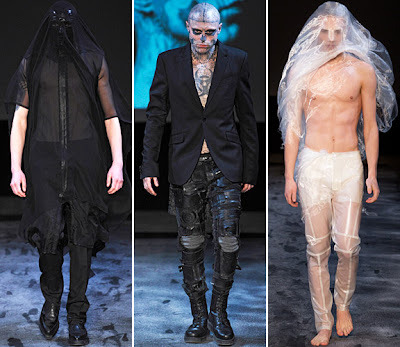 All the attention swirling around him caught the eye of Lady Gaga's Fashion Director Nicola Formichetti. His unusual look captivated not only the public but the fashion industry as well. Lady Gaga’s Fashion Director Nicola Formichetti approached him. Now this circus born performer, his act included laying on a bed of nails, is a model & a muse. 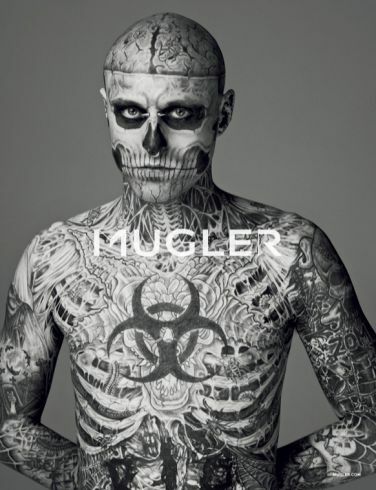 In Febuary 2011 he was featured in Lady Gaga’s video Born This Way, Gaga wore make-up replicating Genest’s tattoos in the video. His most current project is working as part of the campaign for “Go Beyond The Cover” promoting for Dermablend professional makeup products. He appeared in a video where a makeup team covered all his tattoos as an example of the cover-up process. 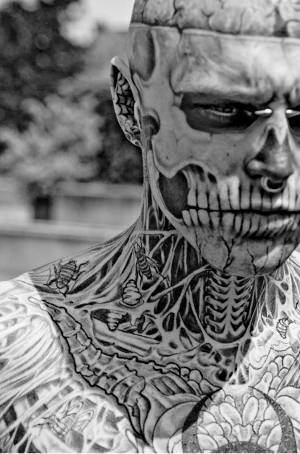 For information on this very interesting man check out these sites ASK MEN , RICK GENEST , & RickGENEST.COM .